What is a Chain Space (ch-sp)? Sometimes when you read a crochet pattern, it’ll tell you to work into a chain space (ch-sp). But what in the world is a chain space? Simply put, a chain space is any space/hole/gap in your work that is created by making a chain. The space is located below the chain. Chain spaces can be created in numerous ways and can vary in size. 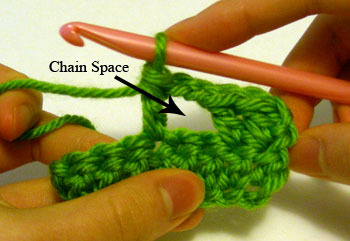 Often times (but not always), a chain space is made by making a chain then skipping a few stitches on the row to make your next stitch. Chain spaces can be made by any number of chains, for instance you can chain 1 or you can chain 5 to create a chain space. In a pattern you may see a chain 5 space abbreviated as “ch-5 sp”. 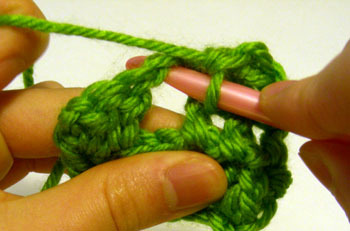 Normally when you crochet into a stitch you insert your hook into the font and back loops of the stitch. But when you are instructed to crochet into a chain space, just insert your hook into the space/hole/gap (underneath the chain) to make your stitch. What this helpful? Let me know! This entry was posted on Thursday, January 7th, 2010 at 3:04 AM by Rachel Choi	and is filed under Tutorials and Help. You can follow any responses to this entry through the RSS 2.0 feed. You can leave a response, or trackback from your own site. 2 dc, ch 3, 2 dc, ch 3, 2 dc in center of next shell? Are there 3 or 4 shells? Also would like more information on how to do : Slip stitch to center of lst shell, (shell over shell. chain 3, 7 tr in ch 5 sp, ch 3, shell over shell) 8 times. Id anyone help you out, or did you get this figured out? I am doing something similar and it looks all wrong. Thank you so much! I had begun a flower in a square pattern and got lost on row 4 when it switched to say to work into the chain space instead of the stitch. The devil is in the tiny details! in a pattern I am reading it say ch3 ch2 21dc ch4, (in the next ch space). Does this mean that I chain 3 then secure it in the next chain space, chain 2 and secure that in the same space, double crochet 21 and secure it in the same chain and then chain 4 & secure it in the same chain space. Hi Mary! You will make the dc into the chain space, you will work the chains as you usually would, you don’t have to secure it in anyway. So do I dc across until the next chain space? Or is it just a dc in next three chains? It seems like you will repeat all of the instructions within the parentheses. Try contacting the designer of the pattern if you can for clarification as it isn’t completely clear in the instructions. It seems like it wants you to make a single crochet into each of the next 25 sc, then make 8 single crochets into a space that was created by chaining 5 on the previous row. Hi Amanda! It means that 8 spaces that are created by chaining 2 will measure 4 inches. And 10 rows in the pattern will measure 3 3/4 inches. It means that you will make a treble crochet into the first chain space, then a v stitch into the next chain space, and then a treble crochet into the next treble crochet stitch. I have a pattern that states that, after joining a round with a slip stitch, before going into 2nd round, it says; ” 6 ch – 3 SPS. I can’t figure out what that means; can you help? That sounds like the stitch count for the round. You don’t have to do it again, it is just there so you can double check your work. You will have 6 spaces that were made by chaining 3. I’m having trouble understanding an instruction in a repeat and have searched online for days. I hope you can help me. The problem is in R3, but thought helpful to include R2. The finished picture is a wave pattern with no open spaces. Does this mean to work into the chain 7 space? If so, with what sts? Also if I work “into” the space, seems to me there will be a large hole, multiple times down every row and that doesn’t match the picture at all. So confused and disheartened. Can you tell me what i’m missing? Hi Lisa! It doesn’t look like you are going to work into the ch-7 space, instead you’re working over it and into the stitch on round 1. When you did the chain 7 on round 2, you skipped 5 stitches on round 1. So you will work over the ch-7 space and “sc in 3rd sk st” that is on round 1.